Even though a late frost damaged many of the blossoms on my azalea shrubs, there were many that survived near the ground. So before those were gone too, I picked some to do this painting. 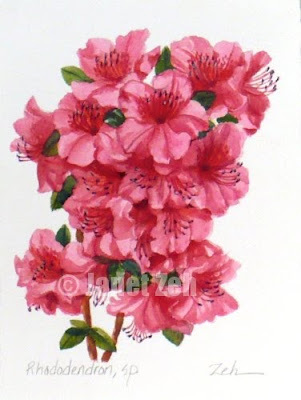 We call them azaleas, but botanically they are Rhododendron. This 5"x7" painting is done from the live plant using mostly watercolor, but a bit of colored pencil in the details. You can see my botanical prints at Prints.ZehOriginalArt.com in the botanical section. Thanks for stopping by. Have a lovely day!